"You're scum! You're ALL SCUM!! You should be thrown out of here!! Today has seen the Irish equivalent of the Brits Adwards on live television and this is the Post-Event Industry Do complete with vastly expensive meal, free drink and a bit of a "disco" afterwards. It's the usual set-up: huge round tables for each "celebrated" record company faction, balloons aloft, dinner suits, diamante shoulder pads from hell etc. etc... Then there's the Sony table. Manic Street Preachers are signed to Sony records. Everyone is staring at them and no-one is remotely impressed. For a start they've got make-up on and funny girls' blouses and fur coats that look like they may have moth balls in. Nick's popped loads of balloons, keeled over with his head on the table and slid floorwards to end up flat on his back before we've even got to the main course. Richey's poured several bottles of wine into the gigantic ice bucket in the middle of the table, added some salt 'n' pepper and watched it overflow all over the table and cause a calamitous flood. Sean's been shouting "boooooring!!!" in a very loud voice and James... well, James has verbally, and near enough physically attacked today's television presenter for slagging them off on live TV and pulled off by some not-to-chuffed security men. The Sony table itself is finally physically removed fron the premises due to it's disgustingness, the Manics are branded "a disgrace" by waiters and quietly to himself, "there must be more to life than this..."
It was inevitable really. On the Friday morning they were in a photographic studio in London having their picture taken for their favourite young person's tribune i.e. 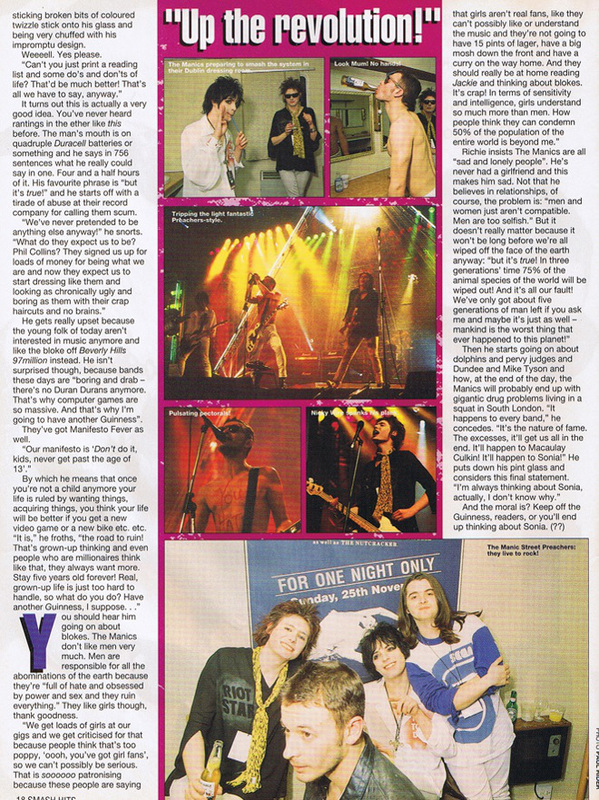 Smash Hits, and having a few celebratory vodka's and orange. There wasn't much time for a "proper interview" due to their suddenly requested TV appearance, so they decided to invite Smash Hits to Dublin with them, on the spur of the moment, because they thought it'd be a "really good laugh". So we all pile into this enormous stretch Daimler glamour-mobile and one gets to realise what a bunch of good lads the Manic Street Preachers really are. They show you their badges. Nick's wearing an ancient Kylie one from when she had a perm: "the pre-seductive era. Makes you think, eh?" 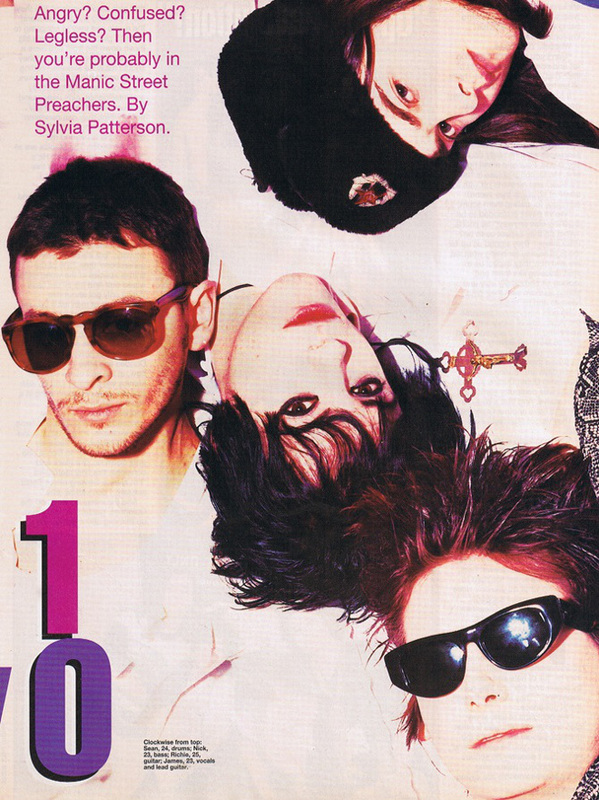 The Manics love Kylie they think she's "a genius of pop". They play a tape of Duran Duran's greatest hits have arguments about which tune is the best. They are fantastically friendly. And there's the accent, of course. It is far more Welsh than you could ever imagine and is really gentle and tuneful and makes one forget they are here to put the wind up the so-called "establishment" and let the young folk have something to believe in again. Manic Street Preachers invented themselves out of boredom with their lives in "a crappy little town in the south of Wales" called Blackwood. They've known each other since they were tots (Sean and James are cousins). They first came to light at the end of 1990 and the world of popular music has been going on about them ever since. They play ancient music a bit like punk rockers of yesteryear The Clash, look like glam-rock stars from 1973 and are actually "sensitive poets" in disguise. They talk about poetry and art and literature and believe they're the only band in the universe these days "with something to say". They're all really good-looking and have fabulous teeth (especially Nick) and exquisite nose and have something to say about everything. Apart from James who is intensely serious and quiet and a very deep sort of person. At 12 noon on Saturday the band appear in the Dublin hotel bar and the events of last night are a faded, wispy memory. James, Sean and Nick all disappear upstairs to watch the "all-important" England V. Wales rugby match on the telly. Richey stays. He's spent the morning watching Going Live! and The Chart Show because he is totally fascinated by the culture that is pop. He is the band's spokesperson and not without reason. He starts talking... and doesn't belt up for four and a half hours. It is quite extraordinary. The Manics mission is a simple one: they want to make music seem galmourus and interesting again, make people wake up out of the "boredom and meaninglessness of the 20th Century life" and jump up and down to some good old rock 'n' roll music and think about things and have a laugh because at the end of the day none of us will ever be happy. "I suppose I'll have to do an interview then? enquires Richey, sticking broken bits of coloured twizzle stick onto his glass and being very chuffed with him impromptu design. "Can't you just print a list of do's and don'ts of life? That'd be much better! That's all we have to say, anyway." It turns out this is actually a very good idea. You have never heard such rantings in the ether like this before. This man's mouth is on quadruple Duracell batteries or something and says in 756 sentences what he really could say in one. Four and a half hours of it. His favourite phrase is "but it's true!" and he starts off with a tirade of abuse at their record company for calling them scum. "We've never pretended to be anything else anyway!" he snorts. "What do they expect us to be? Phill Collins? They signed us up for loads of money for being what we are and now they expect us to start dressing like them and looking as chronically ugly and boring as them with their crap haircuts and no brains." He gets really upset because the young folk of today aren't interested in music anymore and they like the bloke off Beverly Hills 97million instead. He isn't surprised though, because bands these days "are boring and drab - there's no Duran Durans anymore. That's why computer games are so massive. And that's why I'm going to have another Guinness". They've got manifesto fever as well. "Our manifesto is 'Don't do it, kids, never get pass the age if 13'." By which he means that once you're not a child anymore your life is ruled by wanting things, acquiring things, you think your life will be better if you get a new video game or a new bike etc. etc. "It is," he froths, "the road to ruin! That's grown-up thinking and even people who are millionaires think like that, they always want more. Stay five years old forever! Real grown-up life is just to hard to handle, so what do you do? Have another Guinness I suppose..."
"We get loads of girls at our gigs and we get critisised for that because people think that's too poppy, 'oooh, you've got girl fans', so we can't possibly be serious. That is soooooo patronising because these people are saying that girls aren't real fans, like they can't possibly like or understand the music and they're not going to have 15 pints of lager, have a big mosh down the front and have a curry on the way home. And they should be home at home reading Jackie and thinking about blokes. It's crap! In terms of sensitivity and intelligence, girls understand so much more than men. How that can condemn 50% of the population of the entire world is completly beyond me." 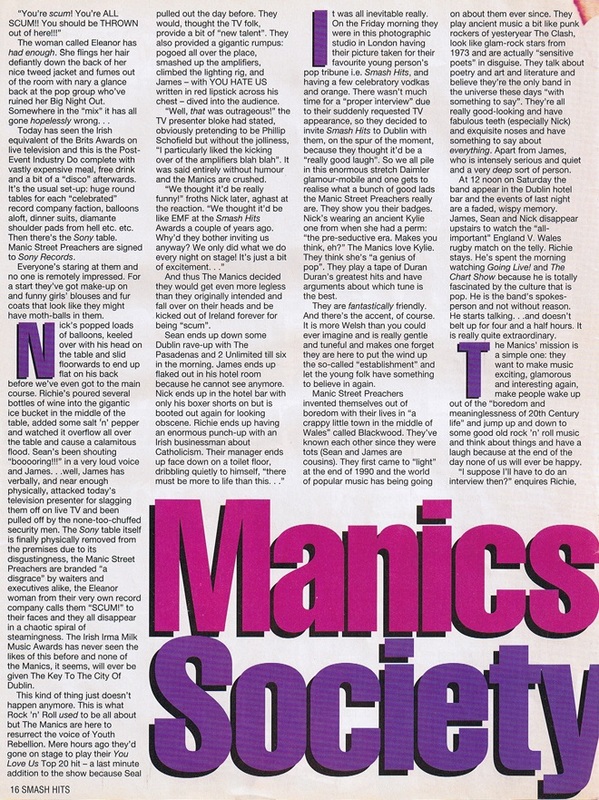 Richey insists the Manics are all "sad, lonely people". He's never had a girlfriend and this makes him sad. Not that he believes in relationships, of course, the problem is: "men and women just aren't compatible. Men are too selfish." But it doesn't really matter because it won't be long before we're all wiped off the face of the earth anyway: "but it's true! In three generations' time 75% of the animal spieces of the world will be wiped out! And it's all our fault! We've only got five generations of man left if you ask me and maybe it's just as well - mankind is the worst thing that's ever happened to this planet!" Then he starts going on about dolphins and pervy judges and Dundee and Mike Tyson and how, at the end of the day, the Manics will probably end up with gigantic drug problems living in a squat in South London. "It happens to every band," he concedes. "It's the nature of fame. The excesses, it'll get us all the end. It'll happen to Macaulay Culkin! It'll happen to Sonia!" He considers this final statement. "I'm always thinking about Sonia actually, I don't know why." And the moral is? Keep off the Guinness, readers, or you'll end up thinking about Sonia.